Successfully Added 7 inch HD Touchscreen GPS Navigator (FM Transmitter, High Power CPU) to your Shopping Cart. This handheld portable GPS navigation device utilizes the lightning fast AtlasV chip, 4Gb memory and the Windows CE 6.0 operating system for awesome power and performance. Along with a rich media enhanced operating environment, this product gives you the best user experience possible. Media Player: This handheld wonder features a stunning 7 inch touchscreen TFT LCD screen to bring all your videos to life! You can play multimedia files like MPEG, WMV, ASF, AVI, and DAT saved in the internal 4GB memory or on external SD cards and USB thumb drives with a maximum of 8GB capacity. 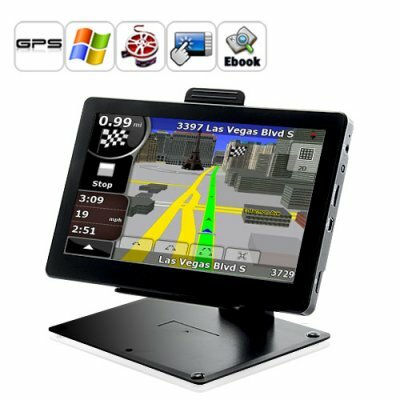 Extra Functions: Not only is this 7 inch Touchscreen GPS Navigator an award-winning portable GPS device and multimedia powerhouse, it is also a remarkable eBook reader, gaming machine, and mass storage device! The FM transmitter allows you to simply pair your cars stereo with the this GPS Navigator and listen to the sound output directly on your cars own speakers. on 2011-04-15 05:56:04 Nice machine! For this money it is a very good offer. high resolution and high processing speed. Runs iGO 8 extremely well. I use it on my motorcycle. all in all a very good bargain!